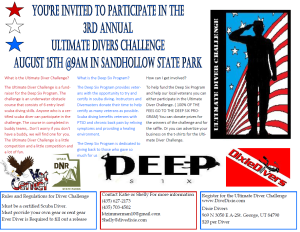 ST. GEORGE — The 3rd annual “Ultimate Divers Challenge” is set for Saturday at Sand Hollow State Park with proceeds going to support disabled veterans. The challenge is an underwater obstacle course that consists of six entry level scuba diving skills. The course in completed in teams of two. If you do not have a partner, the challenge can provide one for you. To participate you must be a certified scuba diver and provide your own gear or rent gear. Registration for the challenge is available online, and the cost is $20 per diver. To help veterans you can either participate in the Ultimate Divers Challenge, donate prizes for the winners of the challenge and for the raffle or advertise your business on the t-shirts for the challenge. All of the proceeds from the challenge will go to support the Deep Six program which funds scuba diving certification for up to six disabled veterans, at no cost to the vets. These vets can be either physically or emotionally disabled – post traumatic stress disorder, traumatic brain injury, amputations, disabling injuries, etc. they must apply by Aug. 30. Support letters are requested and important to the determination of who gets the scholarships. Hydrotherapy, either scuba or snorkeling, is a proven blessing to disabled vets bringing tranquility, anxiety relief and even pain relief. Instructors donate their time to help certify as many veterans as possible. The Deep Six Program is dedicated to giving back to those who gave so much for us.